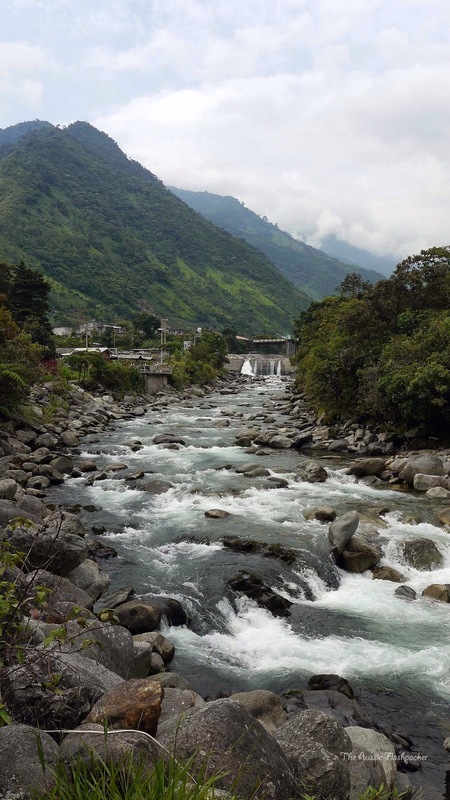 We arrived into Baños a little unsure of what to expect and a little weary eyed after some heavy nights in the beach party town of Máncora with a plan to see a few sights and spend a couple of days of days relaxing around the thermal baths before heading up to Quito. Little did we know that this would be the exact opposite of what Baños had in store for us. Baños is a city in Eastern Tungurahua Provence in central Ecuador. It is lush and green with year round idyllic spring-like weather. 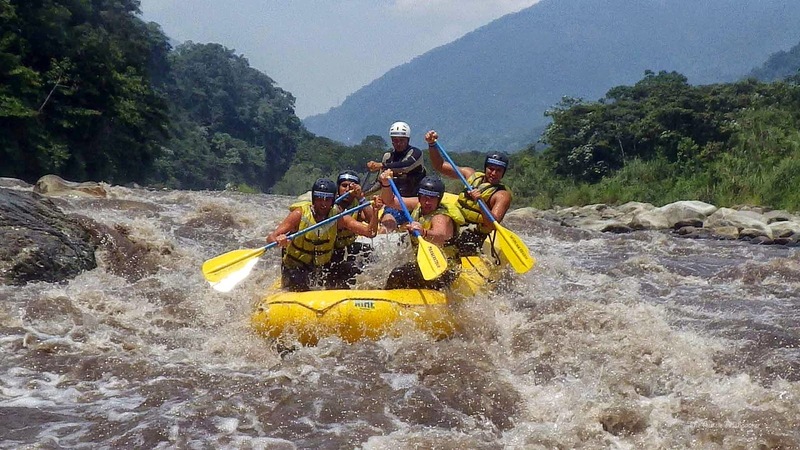 It has mountains, active volcanoes, rivers that are perfectly designed for rafting to suit all levels and of course their world famous hot springs. We stayed in Great Hostel, a backpackers ideal hostel with free dinners (so long you signed up that morning), a decent breakfast and a large common area that’s great for meeting other travellers and sharing advice on the days adventures and activities. 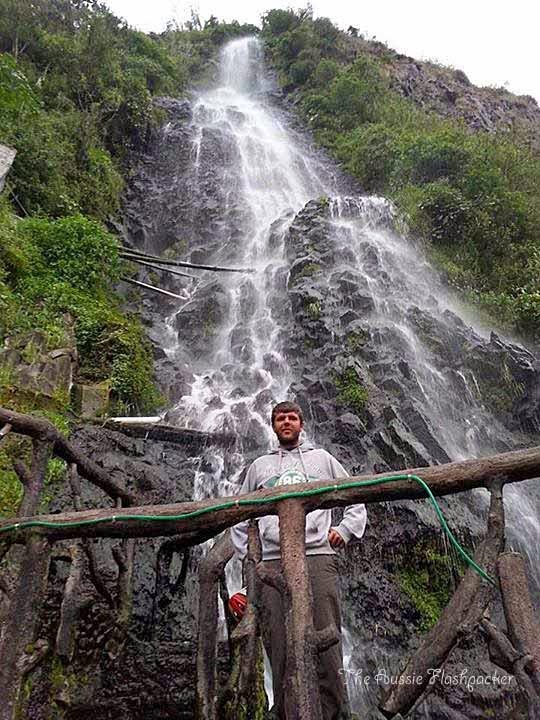 The best option to see the waterfalls is to take a chiva tour. There are so many different places to book your tour from around the town or even through your hostel. 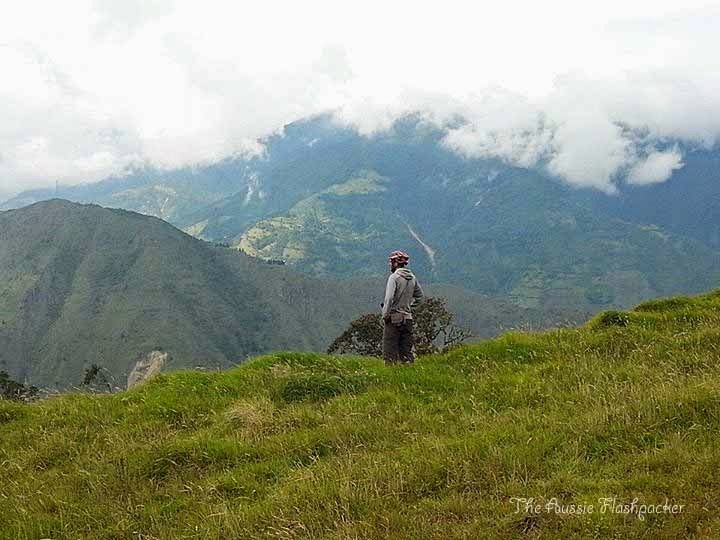 The chiva tour takes you to all the local sights of the area, countless waterfalls and viewpoints (so make sure you have your camera at the ready!) 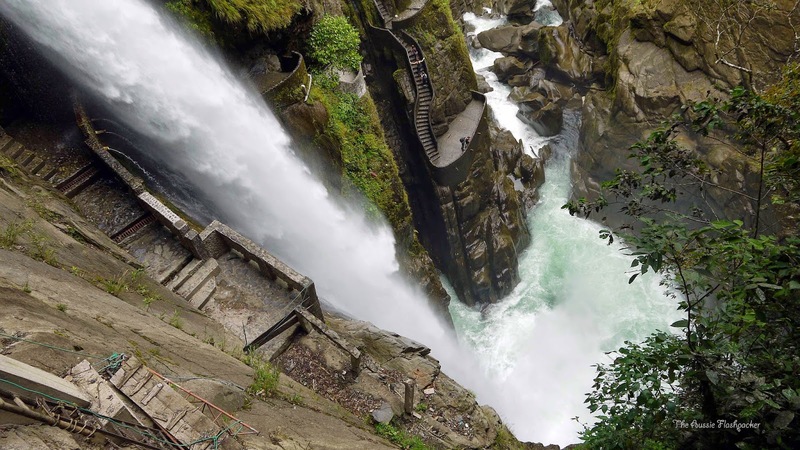 The highlight of this is el Paílón del Diablo or otherwise known as the Devils Cauldron, which is the largest waterfall in the area and simply breathtaking. 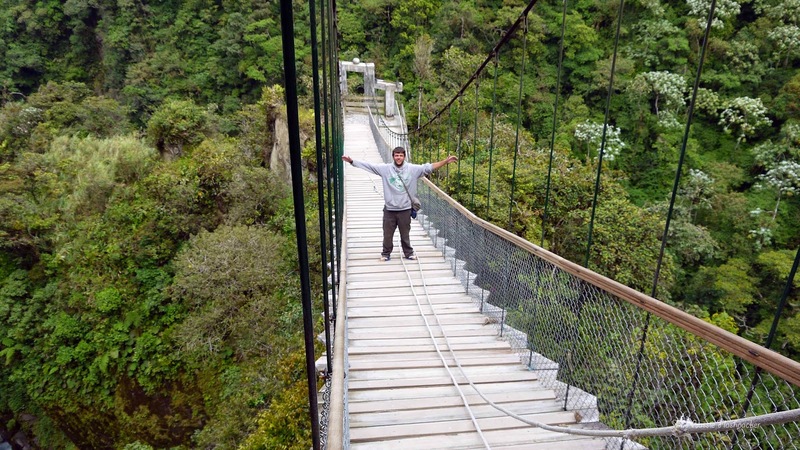 For the adventurous you can take the suspension bridges and steps to get close up and really feel the power of the water. 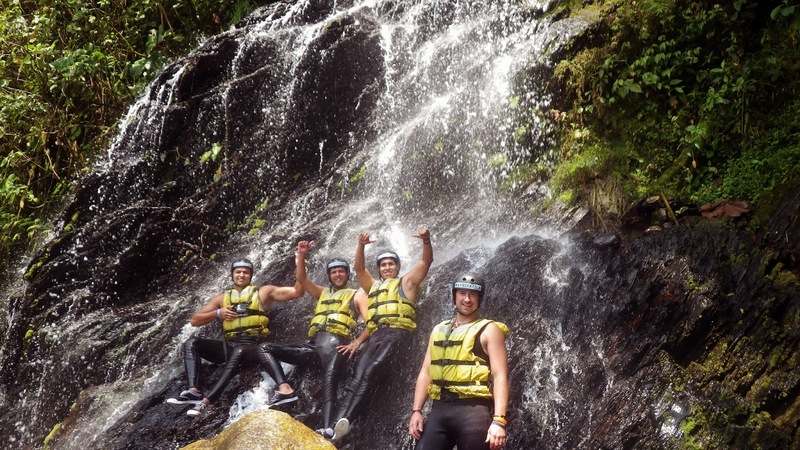 The tour also stops at a few different adrenaline activities allowing you to take the plunge. We had the option to try several different zip lines, zooming across large canyons and an incredible speed with the choice to go either head or feet first. It is definitely enough the get the blood pumping. 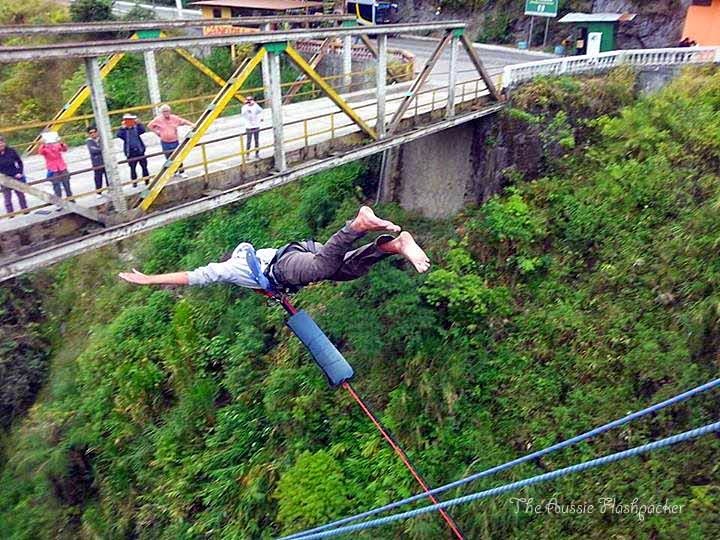 The town also has 2 different locations where you can take a bridge jump. 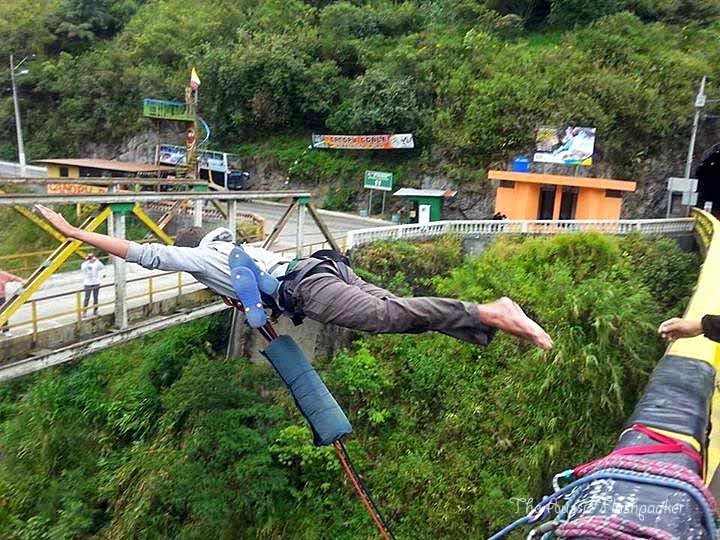 With a rope attached to either side of the bridge you take a leap outwards off the bridge as hard as you can and then swing your way down. Actually making the jump is one of the scariest things I have done but definitely worth the rush of adrenaline and excitement afterwards. I’d highly recommend it for the adventure seeker’s out there. 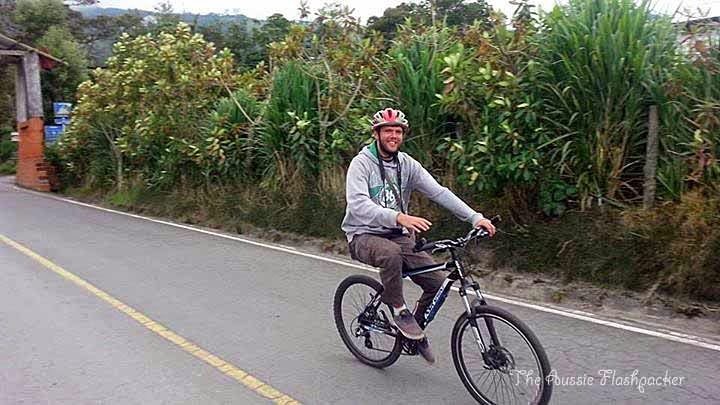 We also opted to rent mountain bikes from one of the many companies around the town. there’s loads of different bikes and varying prices, so make sure you shop around to get a good deal! We chose a package deal where we were given a ride to the top of the hill where the famous Swing at the End of the World is located and then rode home. 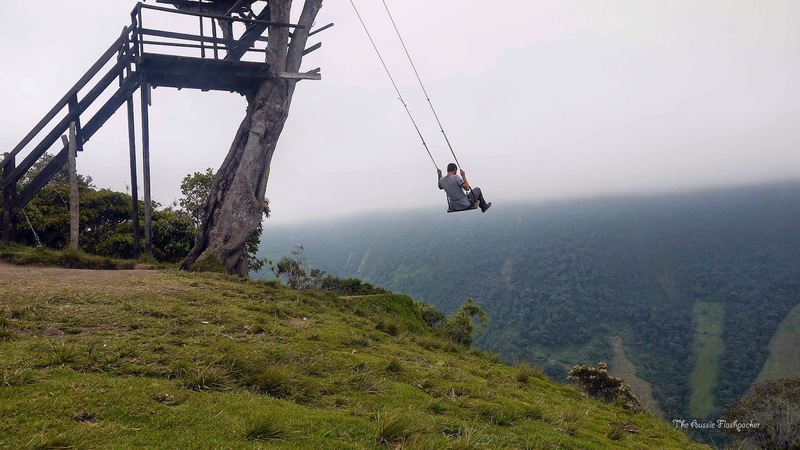 The swing is basically a swing with roughly 15 ft of rope that swings out over the edge of cliff. 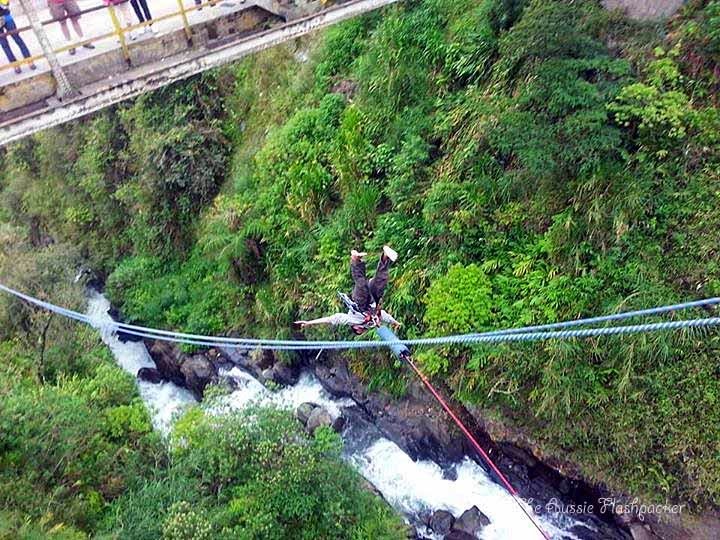 It is brilliant fun, a bucket-list must and there’s also a small strap to keep you safe! The downhill ride back to the town was potentially more dangerous then the swing with the ridiculous speeds you can build up going down the mountain. Make sure you finish with a stop off at the thermal baths to rest your bones and relax as we did. The baths can get quite busy in the evening as they are frequented by all the locals as a way to relax and socialise at the end of a long day. There are numerous pools, all at different temperatures with the hottest one going up to a toasty 43ºC. 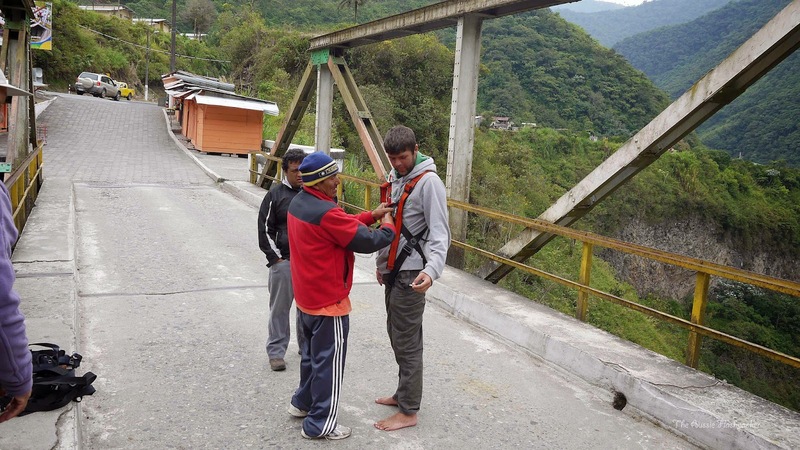 Our last day in Baños we tried our hand at white water rafting and booked a day trip through our hostel. 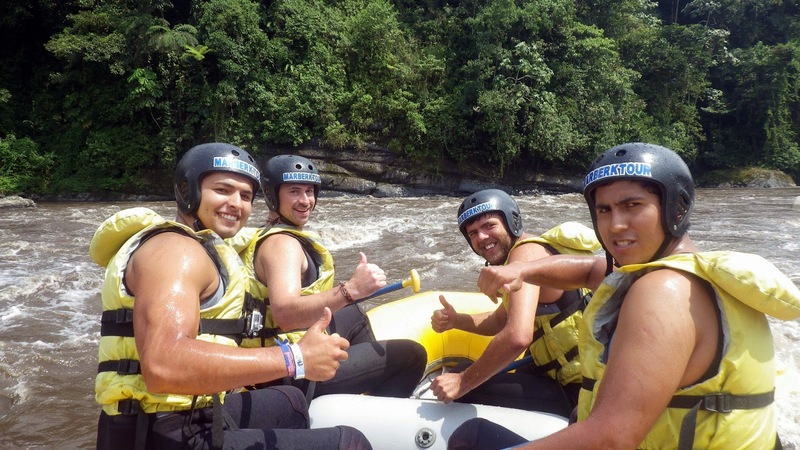 After being kitted up and finishing the safety briefing, an English, Irish and 2 Chilean guys attempted to tackle the rapids of Baños. The river provided us some challenges and at times our boat was completely battered by the rapids and all of us just about holding in and just about managing to stay in the boat but there were other times when the river slowed and we were able to relax and enjoy the amazing scenery, It was the perfect place for my first rafting experience and I am extremely keen to give it another go. Leaving Baños on a bus headed towards Quito we couldn’t believe how much we had hugely under-estimated this place. 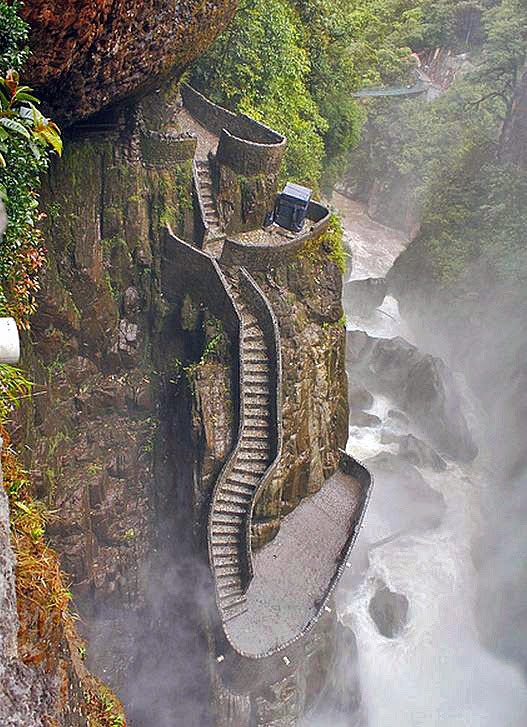 What an amazing place for thrill seekers to dive right into adventure. I couldn’t recommend it any higher. Good luck! Do you seek out adventure when you travel? 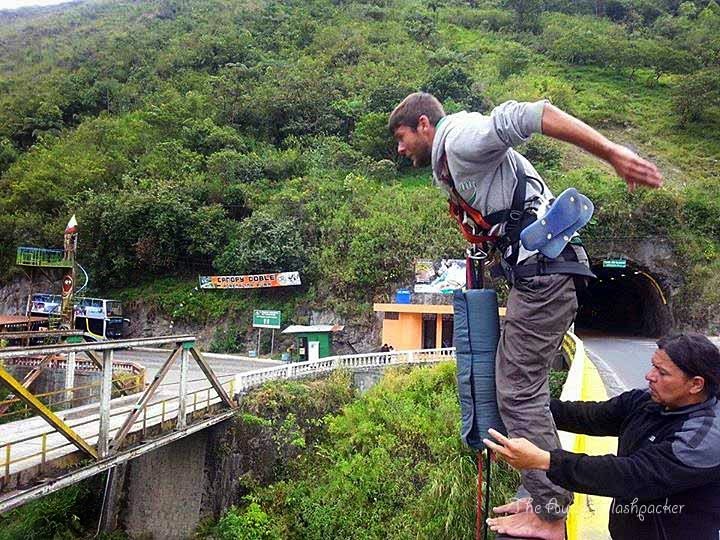 What are your best adventure travel experiences?